Bombin embrague HONDA CR-V 2.0 16V, Año: 2000, Observaciones: De hierro. Llámanos y pide tu pieza. Te ayudamos a encontrar lo que necesitas. Atendemos por whatsapp. Enviamos piezas a toda España. Código interno: 404995. Bomba embrague HONDA JAZZ 1.4, Año: 2009. Wir können es überprüfen. Nous pouvons le vérifier. QualityMADE IN JAPAN clutch slave cylinder for the S2000 AP1(1999-2003). THIS WILL NOT FIT 2004-2009 S2000. Complete slave cylinder at an unbeatable price ! Over 95% of our parts are MADE IN JAPAN, and Manufactured by OEM Japanese Manufacturers. Código interno: 498417. Bomba embrague HONDA CIVIC BERLINA 3/4 1.4 S 3 Berlina, Año: 1995. Wir können es überprüfen. Nous pouvons le vérifier. Clutch Slave Cylinder. Prelude 1.6. Any given vehicle may have a production run longer than the dates shown, the dates given are usually specific to the part listed fitting the models shown. Vehicle manufactures often alter or have alternative parts specifications for any given model during its production run. Bombin embrague HONDA JAZZ 1.4, Año: 2009. Referencia : 46930SNAA41. Código interno: 404401. Wir können es überprüfen. Nous pouvons le vérifier. Bomba embrague HONDA PC59 /1/2 CB500XA, Año: 2018, Observaciones: Cable Código interno: 824356. No se realizan envíos internacionales en territorio insular. Please read full listing description carefuly before you order to make sure the part does fit your car. 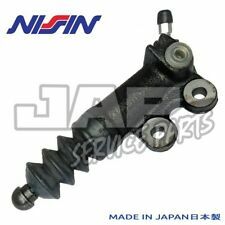 - for HONDA CIVIC 1.4 1.3 1.5 1.6 1.8 1995-2001 CLUTCH SLAVE CYLINDER NEW. Referencia : 46920S7AA04, Observaciones: Cilindro maestro, bomba que va en el pedal de embrague. Nós podemos verificar isso. Wir können es überprüfen. Nous pouvons le vérifier. HONDA FR-V (BE) 1.8 (BE1) Hatchback Petrol 01/2007 on FWD 16 140 103. Function Slave Cylinder, clutch. As a corporation, TRW develop, design, manufacture and distribute almost everything that contributes to passenger safety in cars all over the world. Código interno: 4405409. Bomba embrague HONDA FR-V 2.2 CTDi Comfort, Año: 2007. Referencia : 5K2, Observaciones: Con deposito. Wir können es überprüfen. Nous pouvons le vérifier. This is an original quality part manufactured by Delphi. FOR HONDA CIVIC. This is an original quality part manufactured by Sachs. FOR HONDA CR-V.
HONDA CIVIC Mk V Hatchback (EJ, EK) 1.6 VTi (EK4) Hatchback Petrol 11/1995 02/2001 FWD 16 160 118. HONDA CIVIC Mk V Saloon (EJ, EK) 1.6 VTi (EK4) Saloon Petrol 11/1995 02/2001 FWD 16 160 118. Function Slave Cylinder, clutch. HONDA 46930-SEF-E01. HONDA 46930SEFE01. Inner Thread. CR-V 2.2 CDTi MK 2 (2001-2007) 02/05-09/06. AISIN BH-001. Qualitätsprodukt - Markenware in Erstausrüsterqualität. Sofort-Kaufen Beobachten. You are obliged to take reasonable care of the item. We will work to resolve any issues and assist in anyway that we can. Full Vehicle Details. 1 X NEW CLUTCH SLAVE CYLINDER. TO FIT ALL THE CIVIC RANGE MODELS. CALL US FOR A QUOTE OR BOOKIN. LuK 500 1200 10. Rückgaben und kostenlose Rücksendelabels. Qualitätsprodukt - Markenware in Erstausrüsterqualität. (2) FRONT DISCS SET. 1) FRONT PADS SET. You are obliged to take reasonable care of the item. Part No : ADH23606. Fitting Position : -. HONDA CIVIC 1992-96 1.3 FWD MTM ATM D13B EG3 01/92>09/95. HONDA CIVIC 1992-96 1.5 FWD MTM ATM D15B EG4 01/92>09/95. HONDA CIVIC 1992-96 1.5 FWD MTM ATM D15B EG8 01/92>09/95. NOTE :ONLY FIT TOURER ESTATE MODELS. NOTE :FIT IN PAIRS ONLY. We will work to resolve any issues and assist in anyway that we can. well as all the car details you can provide. ENGLISH OFFSHORE ISLANDS, NORTHERN AND SOUTHERN IRELAND, ISLE OF MAN AND ISLE OF WIGHT ETC. 1 X NEW CLUTCH SLAVE CYLINDER. NOT HESITATE TO CALL US AND WE WILL BE HAPPY TO HELP. CR-V 2.2DT Fd Est - i-CTDi 01/05-12/06. Codice SIVAR. NUOVO Cilindretto Frizione Honda Civic VIII 1.4 97/61 Kw 1.6 84 Kw 1.8 97/103 Kw, CRZ 1.5 Hybrid 84 Kw 2010->, Jazz 1.2 66 Kw 1.4 73 Kw 2008-> 1.3 75 KW 2015->. o ritiro in zona gratuito. You are obliged to take reasonable care of the item. ( 2x500ml SUPPLIED FOR COMPLETE CLEANING). HONDA Clutch Slave Cylinder. A fairly common problem on most Honda models, symptoms include leaking clutch fluid or the clutch not releasing. Part number: 46930-TV8-G01. Suitable for all Civic Type R FK2 and FK8. LPR, hydraulic program is sold in 76 countries, distributed from 6 countries. Function Slave Cylinder, clutch. HONDA 46930S7CE01, 46930S7CE02. HONDA CIVIC VII Hatchback (EU, EP, EV) 2.0 i Sport Hatchback Petrol 09/2001 09/2005 FWD 16 160 118. HONDA 46930SEFE01. Function Slave Cylinder, clutch. As a corporation, TRW develop, design, manufacture and distribute almost everything that contributes to passenger safety in cars all over the world. Codice SIVAR. NUOVO Cilindretto Frizione Honda Jazz 1.2 57 KW Motori L12A1/4 2002-2008, 1.4 61 Kw Motori L13A1/4 2002-2008. We will work to resolve any issues and assist in anyway that we can. well as all the car details you can provide. after you receive the item. B RAND NEW BOXED : IRIDIUM SPARK PLUG SET ( 4 PLUG ). You are obliged to take reasonable care of the item.